CrimePad® is the only tool you’ll need to keep a complete electronic record of all your cases and scenes and ensure that you have a centralized place for all of your data in any environment. Within each case, you have the ability to record as many scenes as you need. The scene of the crime, areas where searches are conducted, vehicles, or any other type of location where data collection is required can all be logged under a single case for your investigation. All aspects of the scene can be added at any time and in any order. This gives you the ability to work the scene the way you need to work it. CrimePad® is there every step of the way no matter what function you are performing. 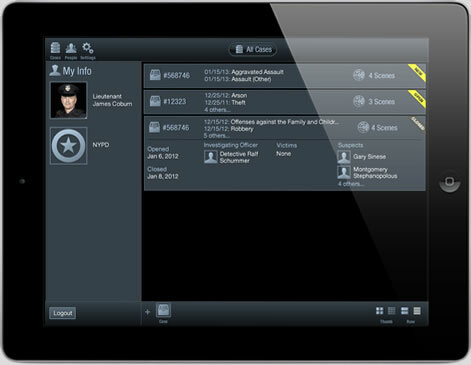 CrimePad runs on iPads, Windows Tablets and Laptops, Android Tablets, and Macs. We have made it easy for you to access your data from any computer or device at any time. You can download the iPad version with offline functionality here. Our online-only browser version is available for Apple devices, Windows, and Android here. Browser Requires: IE 10 or higher, Chrome, Safari, Android Chrome. 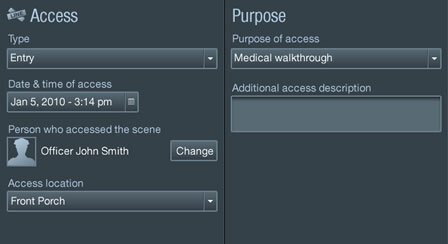 All access in and out of the scene can be easily documented by adding an Access Element. 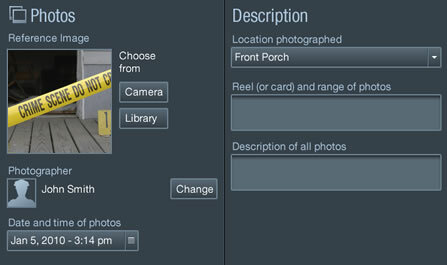 The who, what, where, and why of personnel at the scene are recorded to ultimately compile a comprehensive Access Log. Need to jot down a quick note? CrimePad® allows for free text notes in any area of a case. Furthermore, with iPad’s speech to text feature, this makes the entry of a note quick and easy. 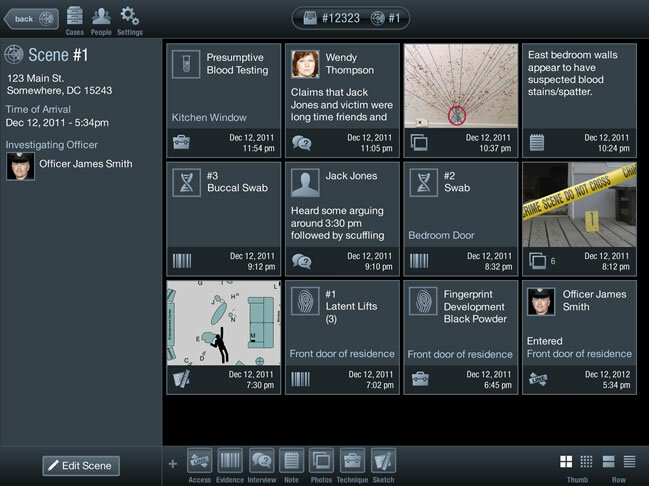 All evidence collected can be recorded in CrimePad®. Easy-to-use drop down menus and areas for collection information make building a complete Evidence Log a simple task. 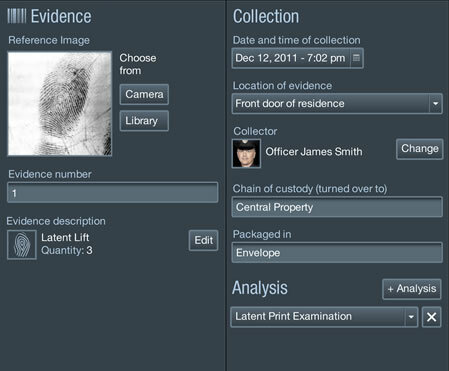 You can also attach a reference image of each item of evidence to provide a visual image of what was collected. These images may be downloaded from your SLR or taken directly with the camera built into your iPad. 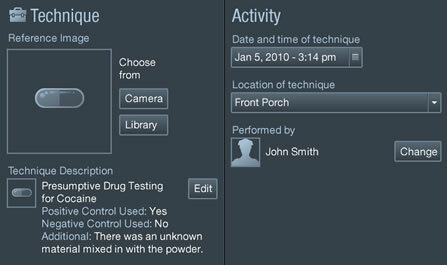 With CrimePad®, you can now document all processing techniques and actions performed at the scene, even if no evidence was obtained as a result. Each technique, including where and when it was performed and by whom, is easily recorded to accurately reflect what was done at the scene. Interview information can be extremely valuable while on scene and can aid in the scene processing and investigation. 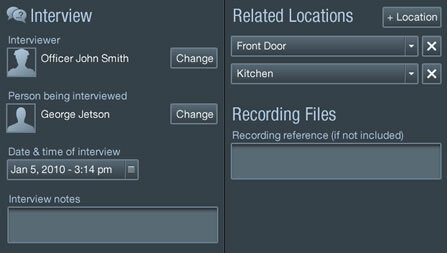 CrimePad® can document when interviews were conducted, by whom, who was interviewed and the information obtained. 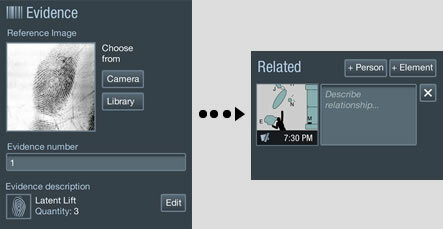 You can record all photograph and sketch information in CrimePad® as well. This includes pictures of hand-drawn sketches and all information regarding what photos were taken, streamlining the organization of this type of information. CrimePad® gives you the ability to establish relationships between each of the various elements. For instance, a specific technique that was performed may have resulted in evidence that was collected. By establishing a link between the specific technique and the evidence item, you are painting a more complete picture of how all actions, evidence, and information fit together to help tell the entire story.